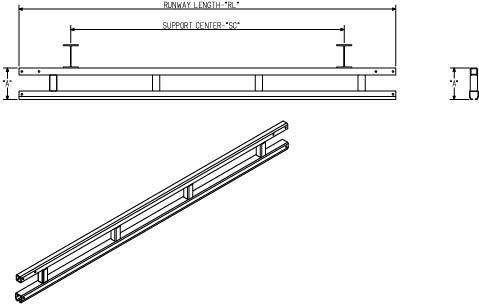 We’ve received a lot of recent inquiries about the difference between plain track, trussed track (often referred to as “workstation”), and standard I-beams for cranes. Hopefully this post will clear up any questions you may have and provide readers with a clearer understanding about what differentiates each type of track/beam. The word workstation refers to a type of enclosed track, which most overhead crane manufacturers use to design their bridge cranes. We also make a workstation jib crane, which uses that same type of track profile. There are two types of enclosed track: trussed track (for workstation cranes) and plain track (often used for aluminum runways and bridges). They are both designed using the self-cleaning V-profile shape that maintains end truck and trolley alignment and allows for easy manual movement in any environment. There are several reasons that enclosed track is so beneficial, but perhaps most importantly, it prevents dirt accumulation inside the track and ensures smooth, ergonomic trolley movement. It’s also maintenance free and extremely easy to use. As we specified above, there are two types of enclosed track: the trussed workstation track (or boom for workstation jib cranes) and the plain enclosed track. Trussed track is used for any workstation type of crane. It’s beneficial because it’s much sturdier than plain enclosed track, and the trussed steal allows for increased spans with fewer supports needed for runways. This reduces costs, provides multiple installation choices, and helps to keep overhead space clear for other larger cranes or overhead equipment. Plain track is not reinforced like trussed track, but it also has some benefits. Plain track systems—like our aluminum bridges and runways—are lightweight and don’t put as much stress on overhead beams and support centers. 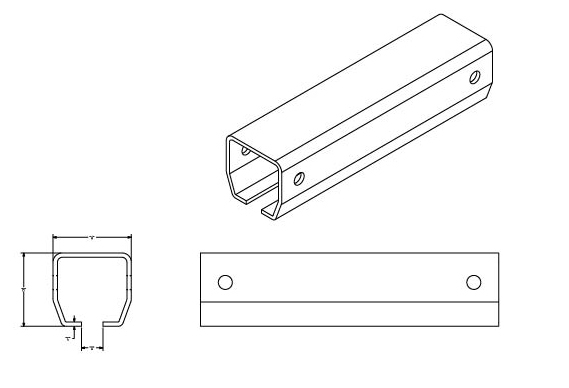 For workstation bridge or monorail systems, plain track is a great option depending on the needs of your application. They are cost-effective, but don’t achieve the same span as reinforced trussed track systems. Still, plain Alu-track is perfect for lighter loads, and are made from maintenance-free, non-corroding, spark-resistant, aluminum enclosed track. I-beams are often used for gantry cranes and most jib cranes. They are capable of handling heavier loads, but aren’t often used for ceiling-mounted systems because they’re weightier than enclosed plain and trussed track. In some instances, like our ceiling/bridge-mounted articulating jib cranes, they can be installed overhead, which is not only cost-effective but also highly ergonomic. Even so, traditional I-beams weigh more than enclosed track/booms, and don’t provide the same ease of movement, quick operation, and maintenance free benefits that come with enclosed track systems.